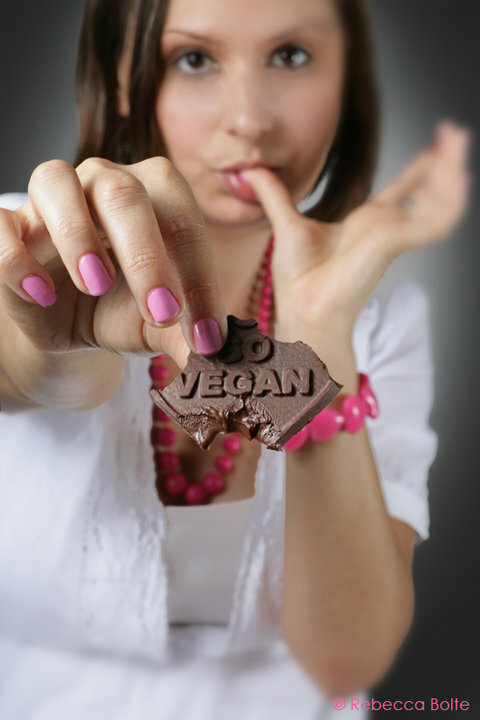 I recently had the pleasure of hanging out with hot Aussie animal activist Leigh -Chantelle of Vivalavegan.net. This little lady is one of the most motivated and inspiring animal activists I have ever had the pleasure of meeting. Her whole life is devoted to spreading the word about veganism, organizing life-changing events, and interviewing others with the same message. She will literally interview anyone, anywhere, anytime. I figured the least I could do was return the favor. What is your home -Brisbane Australia like, in terms of vegan living? Brisbane is pretty great for vegans. In the city itself we have a great veg place, Vege Rama who serve a lot of vegan options. At West End we have the Forest which is all vegan. At Fortitude valley there are two mostly vegan restaurants: Kwan Yin & Tea Master. Out in the suburbs where I live there is my favourite, Loving Hut at Mount Gravatt (part of the Supreme Master restaurants) which is all vegan. I have a lot of get togethers here and the staff are great! At St Lucia near one of our universities is My Heart Garden which is one of our healthier restaurants in Brisbane. Sunnybank where there are a lot of Asian people there is Ho Fu, just around the corner from me in Underwood is Pu Kwong. Most of these places are vegan and Asian-inspired, there are a few Hare Krishna restaurants as well. We have an all-vegan grocery store (similar to Food Fight in Portland or Sidecart in Seattle) the Green Edge in Enoggera that stocks groceries, bulk foods, frozen products, vitamins and minerals, cosmetics etc ALL vegan, fair trade as well as now having the Edge Club where you can order a box full of fruit and vegetables to be delivered to your door. West End market on Saturdays have vegetarian and vegan samosas, pies, sausage rolls, dagwood dogs etc. Northey Street markets on Sundays have great raw vegan food and my good friend, Justin rides around with his Hellhound Hotdogs cart late nights/early mornings most weekends around the city. Can you tell me a bit about vivalavegan.net? When I finished studying Naturopathy, Nutrition and Western Herbal Medicine at college, I released a vegan recipe calendar, Viva la Vegan! That had 12 different recipes and full-colour photos. I started the website to promote the calendar, but since 2006 it has evolved many times. I have re-launched the website a few months ago, it’s very interactive – you can become a member, post on the forum, add recipes and become a vegan mentor. There’s also the educational and informative section where I’ve written a lot of articles, blogs, recipes. I also have a lot of informative videos and many interviews with inspiring vegans from all over the world (including YOU!) I released 3 recipe calendars (2006-2008) and the excess I have are now recycled recipe cards, laminated so you can spill food all over the recipe when you’re cooking and just wipe it clean. I also have “this is what a Vegan looks like” t-shirts and more in the store including my most recent release, the plant-based Detox Diet. Vivalavegan.net exists to connect vegans and to educate the non-vegans. Please tell me all about the Green Earth Festival. Green Earth Group is a not-for-profit environmental awareness group I started to draw people’s attention to one of the basic things we can do for the environment – go vegan! We put on Green Earth Day (previously Green Earth Festival) each March in Brisbane. We also have Green Earth Prom in November and we’re working on free educational seminars about the Environmental consequences of your diet. Green Earth Group and all our events aim to stimulate awareness by bringing environmental, green, health and lifestyle, cruelty-free, recycling and sustainable issues into the public eye. The first Green Earth Festival (now known as Green Earth Day) was held March 2010. We had a main stage with music and spoken word performers, a Kids zone, video zone, speakers tent, art and fashion section, plus 70 stalls with all-vegan goods and foods! It was a great day with 3000-4000 people in attendance. This is a community-based, grassroots event and we really had a lot of passionate people on board volunteering, from school kids to grandmothers! People knew the event was coming from a good place and wanted to get involved. It was the best day of my life, to see in front of you a year’s effort of hard work, energy, enthusiasm, a lot of money and sacrifices, in each person’s happy faces was truly humbling and magnificent! You are seriously committed to helping animals. What would you say the best way to spread the vegan message is? I believe I was put on this earth to educate people about certain things, to encourage others to trust their truths and their instincts and to lead by example with my compassionate lifestyle. I think people need to work out their strengths, embrace them and then turn this towards helping our animal friends. My focus is on educating the mainstream and connecting those already on the path to likeminded people. Vegan outreach is very necessary, I like to lead by example, cook vegan food for others, create events and educational awareness to inspire others, I blog about vegan food, events and more, I run websites, and I utilise ALL social media networking sites. I am a very organised person, I like organising things and I’m good at it. I see that we need to up the ante with what works and get rid of what doesn’t. I am willing to step up to achieve the things that are needed to be done. There’s a lot of talkers and at this stage I’m surrounding myself with people who are just as passionate as I am about actually being part of the solution instead of talking about all the things that don’t work. How long have you been vegan and how did you embark on that path? I’ve been vegan for 13 years now. When I was in year ten at school I made the conscious realisation between life that once was and the flesh I was about to consume after a dinner with my family. My sister and I used to love the same piece of flesh on the leg of lamb we used to have every Saturday night for dinner. This night I asked my mum what piece of the leg of lamb it was and she said it was the Achilles tendon. I remember looking at the piece of lamb and looking down at my own leg and everything fell into place. From that day forth I have not eaten red meat. My transition from vegetarianism into veganism was gradual after this. I still ate chickens and fish until I looked after chickens on a school camp, from then I only ate seafood and this was very rare. I gradually stopped eating seafood and animal products over the next couple of years. I had heard of the term vegan in home economics when I was at school but had always thought that this would have been too hard. The only things I really had to stop eating were ice cream and chocolate (these were very hard to give up at this time as there were not many alternatives available and the internet had only just started) and I became a vegan in January 1997 after I finished school! Tell me about your recent trip to the US. What have you been doing and what have been your favorite experiences? I went to the US mostly for the AR Conference in Washington DC and a bit of a break after my festival. I stayed in LA for two nights and got to spend some time at Animal Acres. I spent most of my time in Portland, OR with some close friends and got to meet most of the active vegan community there especially when I attended the Let Live conference. I did interviews with a lot of inspiring people throughout my 5 week US adventures, explored the vegan areas and ate some amazing food in many areas! I went on a motorcycle trip to Mt Hood and spent a long weekend in Seattle when I was based in Portland OR for three weeks. I then caught up with some friends I’d already met and made a heap of new ones at the AR Conference in Washington, DC. Then spent a week in New York before heading back home. My favourite place I travelled to was Seattle and my favourite thing to do was the long distance Amtrak train trips I went on: Portland to Seattle and back as well as from New York to Washington DC. I had tables for Viva la Vegan! at both the Let Live and AR conferences. I performed a couple of times at AR, spoke with Lori Houston and Alex Hershaft on Staging Effective Events, networked a lot, met some amazing people, made some great friends and a handful of friends for life. Plus I had great vegan tour guides in every state I visited who took me to all their favourite vegan restaurants and we ate and ate great vegan food. I interviewed a lot of inspiring vegans, wrote a blog about my travels and generally just had a great time getting to know my new vegan friends. I can’t wait for some of them to visit me here and for me to be back there!